The following article is a condensed preview of the 30+ page booklet that was included with my "Modern-Day Spiricom" package. The Modern Day Spiricom is an experimental system first introduced to the public on e-Bay in the Spring of 2008. Several prototype units were sold and many interesting recordings have been obtained using the system. Since 2008, I've made a few more modifications and additions to the system, meanwhile the experimentation continues. 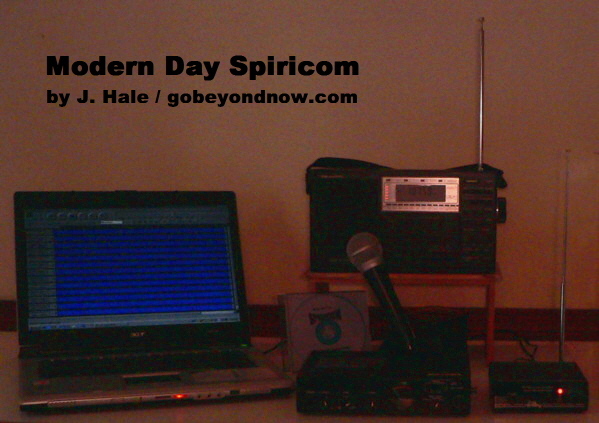 If you have any questions about the Modern-Day Spiricom, please contact me. Thanks! Original material that follows is Copyright 2008-2010 by J. Hale for gobeyondnow.com All publication rights are reserved. An updated version of George Meek's legendary device is simple to make and easy to use. In the early 1970's, a retired inventor and entrepreneur named George W. Meek embarked on the quest to develop a technology-based approach for communicating with spirits of the dead. Just a few years earlier, the discovery of EVP had sparked world-wide interest in trying to communicate with unseen spirits by electronic means, but George Meek wanted something more advanced and less subject to controversy than the rudimentary tape recorder methods being used by EVP experimenters. Meek hoped to devise a system that would consistently allow clear two-way communication between earth-bound individuals and the spirit world. Meek and several like-minded colleagues formed a research group called The Metascience Foundation. In the early stages of their trans-dimensional engineering work the group was guided by communications received in trance channeling sessions with psychic mediums in Philadelphia. During those Philadelphia séances, contact was reportedly made with several deceased but still very communicative scientists. One such contact was with the spirit of Dr. W.F.G. Swann. 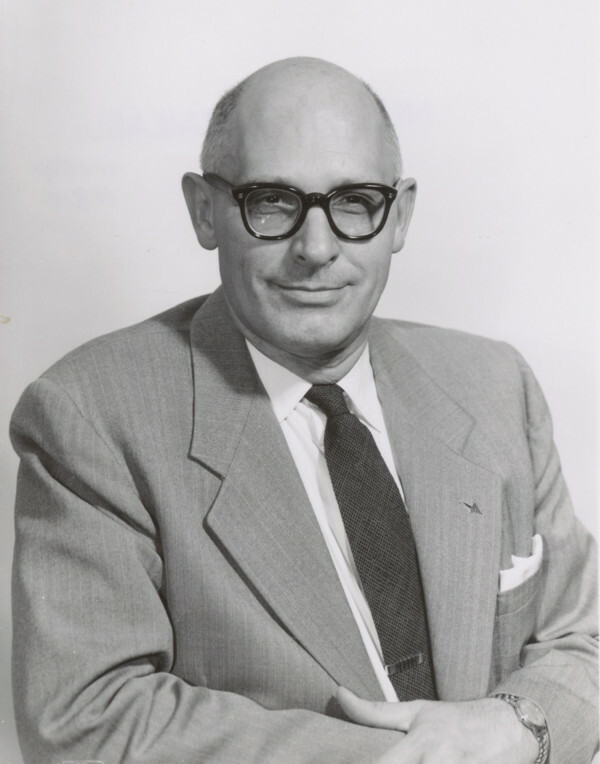 Swann was once a popular science lecturer and a leader in cosmic ray research who had lived (and died) in Philadelphia. His discarnate spirit was said to have provided Meek's group with the theoretical background and technical foundation upon which to begin construction of a new type of spirit communication device. The Spiricom, as it soon came to be called, was born. The name "Spiricom" was used to refer to an evolving series (Mark I - IV, etc.) of experimental devices that were built and tested over a period of several years. Initial results from the Spiricom experiments were both encouraging and disappointing. Some interesting effects were observed but the desired quality of communication remained elusive. Then, in 1977, one of Meek's associates, an electronics technician named Bill O'Neil, reported that he had achieved voice contact with a spirit entity called "Doc Nick" while using the Mark III version of the Spiricom. Doc Nick was said to have been a former medical doctor and HAM radio operator who was able to assist O'Neil, Meek, and the Metascience associates by making technical suggestions for improving the Spiricom. Soon, contact with another deceased scientist was reported as having come to Bill O'Neil through the Mark IV version of the Spiricom. This new contact identified himself as Dr. George J. Mueller and, over the next few years, Dr. Mueller's Spiricom-empowered voice suggested further technical improvements to the system. In particular, Dr. Mueller was credited with suggesting a combination of 13 specific audio frequency tones which were to be used as the optimum background sound source by which a spirit could make itself audible. 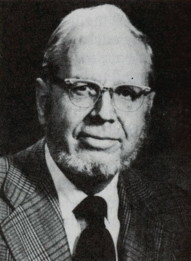 Dr. W.F.G. 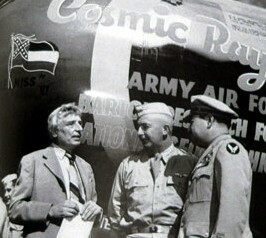 Swann, at left. The major points of the Spiricom story were first presented to a global public in John G. Fuller's 1985 book, The Ghost of 29 Megacycles. George Meek himself also wrote a series of books that provided more details and insight concerning the Spiricom and its development. One of Meek's publications, a booklet from 1982, offers the most "nuts and bolts" information to help us understand what the Spiricom actually was and how it was expected to perform its other-worldly magic. 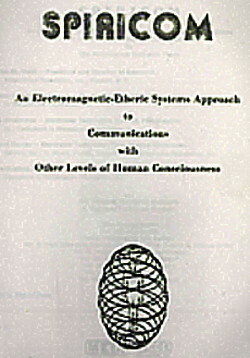 This booklet bears the extremely wordy title: SPIRICOM - An Electromagnetic-Etheric Systems Approach to Communications with Other Levels of Human Consciousness. It is generally referred to simply as, The Spiricom Technical Manual. Contrary to what many sources often state, the Tech Manual does not give a full schematic diagram for building any specific device. The manual does provide a "Functional Block Diagram" however, and that diagram illustrates what the main working components were and how the system was intended to operate. The Tech Manual also provides a detailed review of equipment the Metascience group had tried in the past, and it included discussions on experimental designs awaiting future development. Many people throughout the world have expressed their interest in trying to duplicate the results that Meek et al. claimed for the Spiricom. Since there is such an inherent desire for us, as humans, to wish to reconnect in some way with our departed loved ones and ancestors, one might think that it would be regarded as a noble responsibility for scientists to put the claims made by the Spiricom researchers to the test. However, mainstream science has shown little or no interest in trying to replicate the amazing results reported by the Metascience pioneers. As for the many would-be independent Spiricom researchers out there, most find themselves feeling very intimidated at the prospect of building the electronic apparatus necessary for their own personal experimentation. One reason for the lack of independent Spiricom experimentation is the general belief that the system used by Bill O'Neil was a an extremely elaborate, prohibitively expensive, and essentially unique device. Most people seem to think that the Spiricom system would need to be reconstructed in exact accordance with the original design in order to achieve successful results. However . . .
George Meek and company never intended that the word must refer exclusively to one specific device. Spiricom was and still is an evolving concept ! Although the details and components varied with each version of the early Spiricoms, the operational model remained constant. Basically, that model prescribed that a set of audio frequency tones would be mixed with the signal from a radio frequency transmitter and that any cooperative "spirits" would be able to modulate the transmitted frequencies in such a way as to produce recognizable voice effects. The resultant "spirit voices" could then be detected by a conventional radio receiver, listened to in real time, and simultaneously recorded. 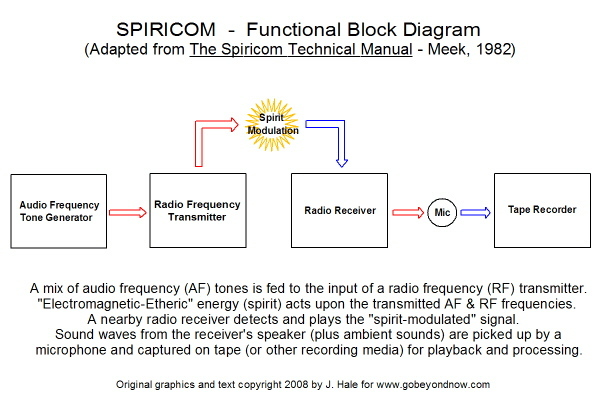 This operational model is actually quite similar to the standard processes employed by normal radio broadcasting, except that with Spiricom, the voice or "intelligence" component of the signal is not injected prior to the transmission of the signal, instead, it is expected to be added by the "electromagnetic-etheric" or "spirit" energy at some point between the transmission and reception stages. Chances are good that most people reading this article already have items number 3-5 close at hand. The radio receiver is a common household item, while the microphone and tape recorder (or other suitable recording device) are standard equipment for anyone already active in EVP and ITC research. Even if you don't have all of these items, they are widely available and can be obtained at relatively little expense. Naturally, the components you choose should be of "good or better" quality, but feel free to start with what you already have or can easily obtain, and then experiment with different components and techniques over time. As for item number 1, the Audio Frequency Tone generator, this was actually the part of the system that presented Meek and his associates with their most challenging engineering obstacle. Crucial for supplying the 13 specific background tones as suggested by the spirit of Dr. Mueller, Metascience's so-called "Multi-Tone Generator" had to be painstakingly designed and custom built. Remember, it was the late 1970's - early 1980's, and most of the engineering people involved were experienced primarily with vacuum tube technology. Well, guess what: It's another century now, and you already have an excellent Multi-Tone Generator sitting right in front of you. Yep, your computer, when equipped with the appropriate audio software, is very capable of supplying the correct mix of audio frequency tones to enable you to make your own Spiricom. In fact, your computer can do the job with more precision, better control and far greater versatility than the 1970's/80's era Spiricom builders could have dreamed. Alright then, you're off to a good start and need only one more component to complete your own working Spiricom: The radio frequency transmitter. Here again, by having begun your quest to build a Spiricom in the 21st century, you have a great advantage over George Meek and his team. True, a good radio frequency transmitter isn't something you can pick up at your local Wal-Mart, or even at Radio Shack, but now, thanks to the internet, you're just a few mouse clicks away from having one sent right to your mailbox. Please read on . . .
Multi-Tone Generator (center top), Tape Deck, and Hammarlund 600 Receiver are stacked in front of O'Neil. After several years of research into the background and theory behind the original Spiricom, several factors recently came together that helped me realize assembling a modern-day version of the device was not just a hypothetical possibility, but a very practical and readily achievable goal. 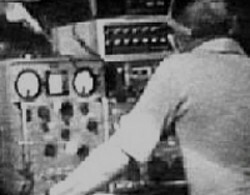 The first breakthrough came when it dawned on me that computers could be used as a substitute for George Meek's Multi-Tone Generator. All one needs for generating the required audio tones is a sound card equipped computer, the appropriate software, and just an average level of computer know-how. As for the radio frequency transmitter, since I happen to be a long-time radio and electronics enthusiast with experience in the field of what's called "Hobby Broadcasting", I knew that good quality RF transmitters are available and very reasonably priced as build-it-yourself kits. I was already aware of some good choices for the transmitter, and in fact had already built several such units for my own use and for sale to others. serve as a high-quality baby monitor or perimeter monitor, that sort of thing. They are not limited to just Spiricom research! Finally, I realized that a good way to present my modern day Spiricom idea, and to enlist the support of others interested in pursuing similar experimentation, would be to advertise the concept on e-Bay. Soon, I went to work on putting together a package that would enable anyone with a minimal level of technical and computer skill to assemble their own working Spiricom. It's possible that you've stumbled onto this site from my e-Bay auction page, so let me say at this point that I definitely appreciate your taking the time to read through all of this explanatory material. I realize it's not the sort of thing you usually expect to encounter on e-Bay, but I 'd like for you to fully understand where I'm coming from with this rather unusual auction offering. Specifically, what you can expect to receive with your e-Bay Spiricom purchase are three "tangible" items plus one that is "intangible". 1) A Radio Frequency Transmitter: At this time I am offering the model identical to the one I'm using in my own experiments. Its a transmitter that I can confidently recommend to you as being the outstanding performer in its price class. It is the Ramsey Electronics model FM10 FM Stereo Transmitter. You will receive an assembled, wired and tested unit by the way, not a kit, complete with audio connector cable, a detachable whip antenna and even the required 9 volt battery. FCC regulations for low power transmitters. However, "low power" doesn't mean "no power", and the FM10 is not a toy! It must be used in a manner that does not interfere with the reception of any licensed broadcasting service. Your FM10 will be prepped to operate at the low end of the FM broadcast band. In fact, the FM10 can be tuned to transmit at a frequency that's actually a little below the standard FM band but still receivable on most FM radios. Using this "special" frequency can help to alleviate the possibility of ordinary radio broadcasts being picked up by your Spiricom device. I'll have more to say about these more technical aspects of using the transmitter in the info package that is included as part of your e-Bay purchase. 2) A CD-ROM: The CD-ROM contains an audio software program plus associated data files which will enable you to use your sound-card equipped PC as the audio tone generator for your own working Spiricom. The data files contain the 13 specific audio tones (as mentioned in the introduction above) pre-recorded for quick installation and playback on your computer. Once you become more familiar with how to use the audio program, you will be able to make adjustments and changes to the tone patterns if desired. Again, instructions for doing this will be provided. The CD will also include a few other software programs that I have found useful for paranormal research, consider them a bonus for more advanced investigations. Obviously, some degree of knowledge about computers, how to copy files from a disc onto your hard drive, how to hook a cable to your computer's earphone jack, etc. will be required. Generally speaking though, anyone with an average level of computer and audio component knowledge should be able to get everything hooked up and running with no problems. 3) An Information Package / Instruction Booklet: This booklet will contain more detailed instructions on using the Radio Frequency Transmitter and your computer as parts of a modern-day Spiricom assembly. It will also contain information and suggestions regarding the components that you are expected to provide yourself, i.e., the radio receiver, microphone and recorder. As mentioned previously, these are standard, readily available items and you should feel free to experiment with what you already own or can easily obtain. In addition, the booklet will contain supplemental information concerning the original Spiricom, including some "lesser known" and "previously unknown" information which my own independent research has uncovered. My continuing assistance to help you in your own quest to experiment with the modern-day Spiricom. I intend to share the results of my experimentation with others who decide to join me in this field of research, and I hope that you will share your results with me as well. If enough interest in this project is demonstrated, I will open a website to post news, developments and suggestions for further research. Meanwhile, anytime you have questions or comments regarding your Spiricom experiments, feel free to pass them along and I will be happy to respond asap. Thanks again for reading all this and I look forward to hearing from you soon! The Modern Day Spiricom is designed around a small kit-built radio frequency transmitter. The prototype system used an FM transmitter. Soon, an AM transmitter system will also be offered for experimenters wishing to test the possibilities available in that band. An additional device called the Crystal Receiver, similar to the old-fashioned crystal set radios, was later added as part of the system with excellent results. The Crystal Receiver in turn inspired a spin-off device, the Harmonic Coupler. This serves as a Radionics type instrument which may help to attract and focus the energy of a specific spirit.